Gundars Rudzitis is a contributor to Writers on the Range, the opinion service of High Country News. He writes in Port Townsend, Washington, where he is a professor emeritus in the geography department of the University of Idaho. Democracies usually prefer not to wage war on their own citizens, and in particular, on peaceful demonstrators. Yet what images were evoked when you saw those photos in the news of police attacking the “water protectors” at Standing Rock with dogs, tear gas, Mace, rubber bullets, water cannons? The marches for civil rights in the American South in the 1960s — and the attacks on those peaceful demonstrators. During nearly a year of peaceful protests, Native Americans and their supporters were met continually by armed police and raw power. Protesters were under constant surveillance and floodlights at night, with aircraft flying overhead. Open land became a militarized landscape, patrolled by police outfitted in full riot gear. And once again, the oppression was directed at the very poorest members of our society. The Standing Rock Reservation has an unemployment rate of about 60 percent; 40 percent of the people live in poverty, and the reservation has among the nation’s highest death and suicide rates. This is a place of despair by any statistical measurements, and yet there’s still a sense of home and attachment for the people who live there. 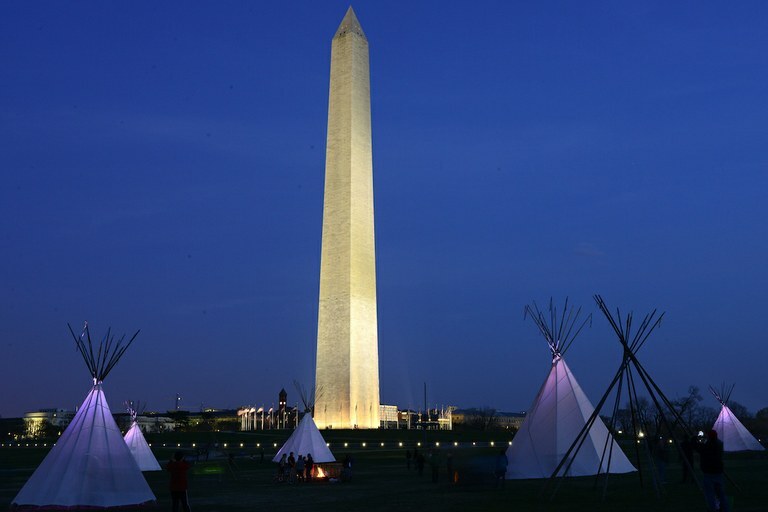 Native American demonstrators established a tipi camp on the National Mall between the Washington Monument and the White House as a staging ground for a rally and march at the Army Corps Of Engineers office on March 9. What was the dispute about? A pipeline that, given proper consultation with the tribe, could have been located elsewhere while respecting and honoring the wishes and concerns of the Standing Rock Sioux. When the citizens of Bismarck objected to putting the pipeline 10 miles from their city, fearing the possible contamination of their water supply, the route was simply moved to within one half-mile of the Standing Rock Reservation. The tensions increased to the extent that, before leaving office, the Obama administration pressured the Army Corps of Engineers to halt construction and require a full environmental impact statement on the pipeline. In ordering a full EIS, the Obama administration was belatedly rectifying what should have been done in the first place. A full EIS is required under the National Environmental Policy Act whenever the government undertakes a “major federal action.” Yet the new Donald Trump administration wasted no time in canceling the required environmental impact statement and giving the easement that is required by law in order to finish the pipeline. Represented by the nonprofit environmental law firm Earthjustice, the Standing Rock Sioux Tribe of North Dakota has asked the Washington, D.C., federal district court to set aside Trump's pipeline reversal, charging that the Army Corps of Engineers’ actions “are arbitrary, capricious, an abuse of discretion” and otherwise not in accordance with the law. A decision is expected in April. What the Trump administration is doing is shameful, an act whose roots extend back to an American holocaust. Trump almost seems to be channeling President Andrew Jackson, whose portrait he has displayed in the Oval Office. President Jackson orchestrated what we would now call an ethnic cleansing — the removal of Indian tribes from their lands in the East to the newly established Indian Territory of Oklahoma. Jackson’s removal order meant that thousands of Indians were sent to their death on a forced march to Oklahoma, now known to history as the Trail of Tears. It is estimated that one-quarter of the 16,000 Indians who were uprooted died on the way. This past history informs our present: Standing Rock was, in part, spawned by the various forms of genocide perpetrated on Indian tribes, a truth that Western historians are now recounting. Indian hopes for the future, whatever they were in the 1800s, were destroyed and foreclosed upon. We will never know in what ways the many individual tribal societies would have emerged and grown, had we let them do so. Will we once again, as in the past, destroy the ability of tribal people to live as they wish, to create their own future? Recently, Indians arrived in Washington, D.C., to gather on the mall and protest the pipeline. Meanwhile, at least one U.S. senator has asked the FBI why “anti-terrorism” specialists visited some of the Standing Rock activists. Will we now classify some nonviolent water protectors as terrorists? We need to come to terms with our past treatment of Indians. While we cannot erase what happened or wipe out the crimes already committed, we are responsible for the kind of society we now live in and create. We can work to honor Indian treaties, respect Indian land rights, respect their sacred sites, and not arrest and imprison people who are fighting for their sovereign rights and freedom. Is this really too much to ask in the land of the “free”?